Fangirls, I haven’t read Divergent, nor have I seen the movie. I justify that with the disappointment I felt at the end of the Hunger Games series, but this book, authored by the same woman who wrote Divergent, is worlds apart from what I’ve read recently. I loved this book quite fiercely, and sped through it, so let’s talk about it. 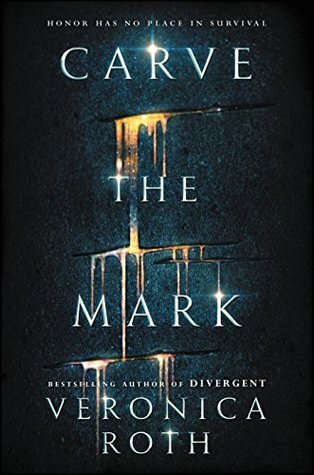 Carve the Mark is a young adult novel set in a different galaxy. A galaxy where oracles predict futures and dates of children, and where everyone has a gift from the current that surrounds their planets. So much is different in this universe than ours, but there are also many similarities. Everyone has screens, where they can watch and read news feeds. Travel between planets is somewhat common. People scavenge, much like our thrifting and upcycling. And there are places that do not get along. The two places that are most fiercely against each other, are on the planet Thuvhe. There are the Thuvhians, who live in the colder areas and harvest iceflowers, and the Shotet, who are a nation unrecognized by the governing body of the planets, the Assembly. The two people are separated by feathergrass, known as the Divide by the Shotet, and nothing else. In Carve the Mark, we see the world from each side; Akos, who was born in Thuvhe and is kidnapped by Shotet, and Cyra, the sister of the Shotet ruler. Akos (along with his brother Eijeh) is kidnapped and trained as a soldier before being brought to Cyra to be her servant. His currentgift disrupts the current, and the current causes pain in Cyra’s gift. He is given to her to relieve pain, and they don’t get along well at first. As the book continues, Akos reveals some things to Cyra, like his plans to save his brother from the Shotet ruler, and leave. She is trusting, until things go awry. I don’t want to give anything further than that away, but I want you to read it. I think this book is beyond incredible; it transported me completely out of this world, and took me to a terrifying and beautiful new one. I haven’t felt that type of escape in a book for a long time, and I am reveling in it. If you’re looking for a book, Carve the Mark is an incredible one to reach for. The sequel came out April 10th, and I’ll most likely be springing for the hard cover.